1) This paper has been prepared and presented as a keynote presentation in Plenary Session 3 – GNSS, Geo-sciences and Surveying at the FIG Working Week 2009 in Eilat, Israel, 7 May 2009. Key words: art of measurement, technological change, skills for surveying, measurement process, surveying measurements. 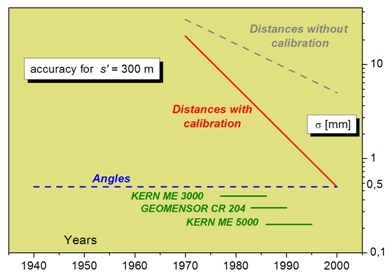 The entire geodetic measurement technique has changed significantly during the last 30 years. In former days the observations were tedious and cumbersome; the quality of the measurements depended directly on the capabilities of the observer. Today our surveying instruments are automatic measuring devices; their results no longer depend on the sharp eyes of users. “Measurements are so easy – just push the button.” This is one important advertising slogan used by all the manufacturers. And it describes the reality: we do not know what is going on inside our instruments, but today the data acquisition itself is easier and much more efficient than it was in past decades. The flow of our data is automatic, as is the entire process of data treatment and calculation. So is there any “art of measurement” left or still needed? In order to answer this question the different eras of surveying will be described and analyzed carefully. Data acquisition has become much easier, but this does not mean that our measurement results are error-free. Nor does it mean that we control the entire measurement process! Are there still mistakes in our data? How do we have to control our measurements in order to prevent undetected outliers or significant systematic deviations? Can we estimate our overall precision and accuracy? The art of measurement still exists, but it is different from the traditional one. It consists, very generally speaking, in the successful design and control of the entire measurement process. What this means will be explained in detail. And it will certainly be much more than just “pushing the button”. Die geodätische Messtechnik hat sich in den letzten 30 Jahren stark gewandelt. Aufgrund der vielen Innovationen durch die Hersteller, ist die Datenerfassung und -auswertung viel einfacher und effizienter geworden. Gleichzeitig ist der direkte Einfluss des Anwenders auf die Ergebnisse stark zurückgegangen. Die Kunst des Messens besteht heute nicht mehr im „sorgfältigen Koinzidieren und Anzielen“, sondern in der Beherrschung des gesamten Mess- und Auswerteprozesses von der Planung bis zum Endergebnis. Dabei ist ein besonderer Augenmerk auf eine umfassende und möglichst unabhängige Kontrolle des gesamten Messprojektes zu richten. What is the value of the science of measurement, when the data acquisition is so easy? Which knowledge and capabilities must a surveying engineer possess nowadays to use geodetic instruments successfully? Does the “art of measurement” still exist? Or is everybody today capable of acquiring and treating geodetic data without specific skills or profound knowledge of surveying? In order to answer these questions, we will begin with a short review of the different eras of surveying instruments. Thereafter the actual situation will be analyzed from different points of view, and finally the “art of measurement” will be discussed. 1.1 In fact – What is Measuring? Leonard Euler (1701–1783) described the process of measurement: “There is only one way to determine and size a value. We have to compare it with a known size of the same type.” This more than 250 year old definition is still valid today. The famous Swiss mathematician continued by saying: “Physics is nothing else than a science, looking for methods for the measurement of values”. Metrology is the science of accurate measurements and as such probably as old as mankind. The German scientist Hermann von Helmholtz founded modern metrology by defining a consistent methodology for all type of measurements in the natural sciences (HELMHOLTZ, 1887). Increased knowledge and cognition. The science of measurement is indispensable and plays a fundamental role in all natural sciences. More objectivity and consumer protection. All goods and services on the public market are quantified today in standardized units and in most of our countries are under strict public control. Automation, quality control, and quality improvement of technical processes. A key element in the fully automated production of parts or entire products is so-called production measurement technology, which is an essential precondition for an automated industrial production. Security. Passenger transportation systems of all kind (airplanes, trains, ships, cars, aerial railways, elevators, etc.) are using sophisticated measurement systems in order to assure safe and comfortable transport. Measuring and surveying are not only activities which have been performed for thousands of years; they are furthermore an important part of our history of civilization. 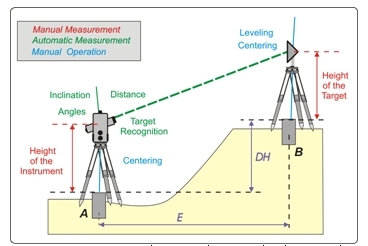 The technical development of surveying instruments can be divided roughly into four different phases (Fig. 1). The archaic Phase lasted thousands of years and ended in 1590 with the invention of the telescope. The following Optical Era persisted for more than 300 years and had its peak at the end in around 1920 with the presentation of the first modern theodolite, Zeiss TH II, designed by the ingenious Swiss inventor Heinrich Wild. The technical progress during the Electro-Optical Phase was tremendous. At the end of the 1980s most electronic total stations offered coaxial (angle and distance) measurements, were equipped with a compensator, and allowed digital storage of the measured points. 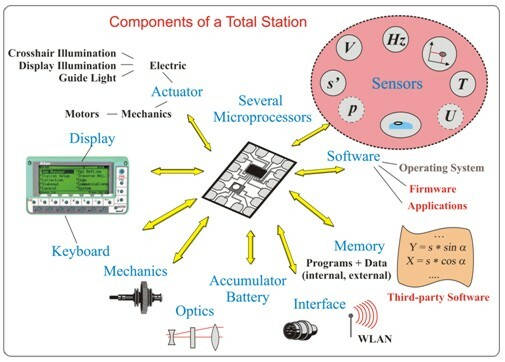 1990 started the Phase of Multi-Sensor-Systems, which continues today. In this year the first digital level (WILD NA 2000) and the first motorized total station (GEODIMETER 4000) were presented. At the same time the GPS was announced as the new universal positioning technique, which makes traditional instruments like total stations needless. In the following years, all types of geodetic instruments were improved in respect of greater efficiency and new functionalities. Figure 2 shows the progress of total stations and GNSS-receivers. It is interesting to note that instead of talking about the substitution of tacheometry by satellite based systems everybody is actually propagating the combined use of both technologies. Fig. 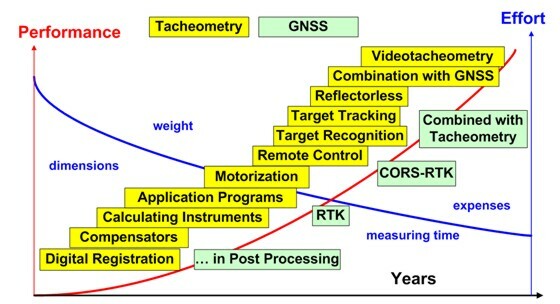 2: The different steps of progress for tacheometry and GNSS during the last 20 years. The main instruments of the surveyor nowadays are the digital level, the total station, and the GNSS-receiver. The combined measurement of angles and distances deliver polar coordinates in the two- or three-dimensional space. Based on this principle we find different types of instruments (Table 1). Terrestrial laser scanning (TLS) is in theory also part of the polar-coordinate-family, but the use and the applications themselves are quite different from those of the other instruments. The traditional acquisition methods of the surveyor are “point-orientated”, while TLS has to be considered as an “element-orientated” approach. The invention of electronic total stations and GNSS-receivers led to the substitution of existing measurement systems. Methods of measuring points were replaced by other methods which are more accurate and more efficient (Table 2). For laser scanners the situation is different. With their capabilities – digitizing entire objects in detail – they enlarge the “tool-box” of the surveyor. New applications and innovative products can be realized which would not have been feasible with traditional surveying equipment due to economical or technical limitations. We have noticed an enormous increase in functionality during the last 20 years thanks to manufacturers. All actual measurement systems are multi-sensor-systems, which are equipped with several sensors and driven by one or more microprocessors (Fig. 3). Raw observation values as we know them, for example from angular observations with an optical theodolite, no longer exist. The actual values shown on the display of the instrument are the result of multiple sensor readings, modified by a range of geometrical and physical parameters. These correction parameters and the entire correction model are not accessible to the user. The multiple sensor readings are used for the validation of the measurement itself (detection of outliers, beam interruption, etc.) and at the same time for an increase in accuracy. A modern total station is nothing more than a mobile PC with geometrical sensors. The observer (with a direct influence on the measurement) is downgraded to the user of a system. The internal processes remain hidden and the manufacturers do not publish information about the technologies used in their instruments. Today many instruments can also be used as autonomous remote controlled measurement devices. 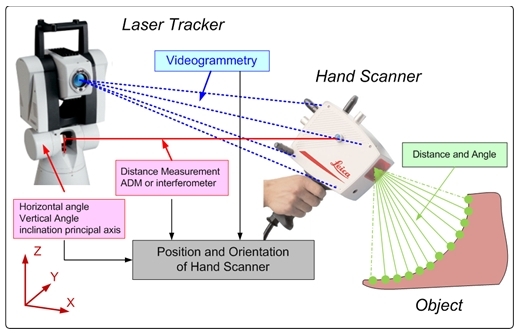 A laser tracker combined with a hand scanner is a good example of the complexity of the actual measurement systems (Fig. 4). The determination of the position and orientation of the hand scanner relative to the tracker is realized in real-time with measured angles and distances (position) combined with videogrammetry (orientation). The coordinates of the object are determined in relation to the actual position and orientation of the hand scanner. During the last 70 years the accuracy of our measurement systems has not always been improved. Height determination became faster and simpler with the introduction of digital levels, but there has been no systemic enhancement of accuracy. The situation for the measurement of directions and angles is quite similar. In contrast to this are electronically measured distances: we note that there has been a significant advancement in precision and accuracy. Fig. 5: Development of accuracy of angles and distances for a distance of 300 m.
The customer is using instruments like a black box. This means he or she has, in general, no idea about the internal technical processes of the instrument. The functionality of the system and the software is so extensive that he or she is using only a small fraction of it. Eighty per cent of the measurements are not controlled. The user is convinced that the results are “true”, and does not care for a regular check of the entire equipment. The life cycle of a specific instrument (normally three to five years) is in general too short for the user. Actual measuring systems are powerful, reliable, and easy-to-use. The manufacturers are confronted with product piracy from China. There are different reasons why a new product or model appears on the market, but only the first of the listed reasons is obvious to the user. Innovation. A new functionality is introduced onto the market, for example, automatic target recognition or automatic target tracking. Non-availability of electronic components. If the OEM-components are no longer available the manufacturer is forced to redesign its instrument, despite the fact that there is no need from the customer’s point of view. Reduction in manufacturing costs. In order to reduce the production costs, manufacturers revise their products. Often only a complete redesign leads to the desired results. Not every product which could be developed technically appears as a product on the market. The (potential) economical success (or return on investment, ROI) in relation to the costs of development must be promising, otherwise the idea will not become a real product. Two examples will clarify this statement. Fully automated leveling system. All manufacturers have the technical potential to develop a fully automated leveling system. The only manual operation would be the rough setup of the instrument and the rods. The rest (leveling of the instrument, searching for the rods, focusing, measuring, calculating, etc.) could be fully automated. Precise distance measurements. The most accurate geodetic distance measurement device is the KERN Mekometer ME 5000 (cf. Fig. 5). It can only measure distances and a single measurement lasts about two minutes. Today it would be possible to integrate this technology into a total station and to achieve similar results with it within a fraction of a second. All new instruments fulfil the manufacturers’ geometrical specifications. Despite the high grade of automation, our results are still influenced directly and indirectly by the user. Considering the standard task “determination of the geometrical relationship between the ground points A and B” (Fig. 6a), we discover that besides the measurements themselves there are the manual operations: centering, leveling, and height determination of the targets and the instrument. If we execute this task with satellite based systems (GNSS), the necessary manual operations and measurements remain the same. Fig. 6a: Measurements between the ground points A and B. 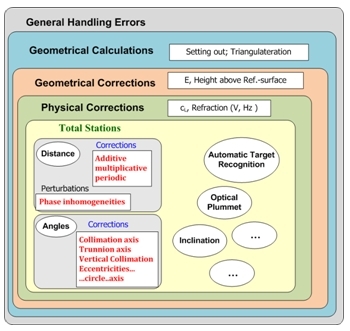 In addition we have to consider the correctness of the parameters for instrumental, geometrical, and physical corrections as well as all the steps of geodetic calculation executed with the instrument (Fig. 6b). Fig. 6b: Shell-model of possible errors for a total station. Geodetic measurements are not always traceable to SI-Units. The specifications regarding the accuracy and reliability of GNSS-measurements are in general very vague and not satisfying. These measurements are subject to a variety of external influences, like satellite constellation, accuracy of orbit parameters, multipath effects, and the influence of the ionosphere. The quality of the point determination depends not only on these factors but also on the time and duration of the observation itself. A measuring system consists of all the components which contribute to the final result. It is constructed not only of the instrument including the accessories but also of the quantity to be measured, the physical environment, the observer (user), and finally the measurement and calculation method in use. If we want to indicate an overall accuracy we have to consider the whole system. The observer had a direct influence on the quality of the measurements (pointing, bringing into coincidence, reading, …). Surveying was a handcraft, demanding a lot of experience and skills. The differences between the measurements also served as immediate indicators of the actual repeatability. The accuracy was improved not only by repetitions but also by well-considered observation sequences. Everybody knows that the angle measurement on both faces included the reversed observation sequence on the second face. The benefit of such a sequence is the elimination of systematic error influences (in this case the “tripod distortion”). Physical environment. Here the influence of the atmosphere on our measurements is the main focus. Refraction is limiting the accuracy of observed horizontal and vertical angles as well as determined distances. During the last 20 years, manufacturers have improved the accuracy of measured distances by a factor of 5 to 10. In order to also make use of this accuracy for longer distances (s > 200 m) we must determine the representative meteorological parameters (air temperature and air pressure) very accurately onsite. If a distance of about 500 m is to be determined with an accuracy of 0.5 mm, the representative air temperature must be known with an uncertainty smaller than 1 °C! Tripods. Different investigations indicate significant vibrations (INGENSAND, 2001) and horizontal torsions (DEPENTHAL, 2004) when motorized total stations are used in combination with normal tripods. But vendors are not offering or even promoting high quality tripods which fulfil the special needs of motorized instruments. Optical plummets. Today we can measure in limited areas (s < 150 m) “below the millimeter”. The transfer of these highly accurate measurements onto the benchmarks fails due to optical plummets, which have not improved in accuracy during the last decades. Today, fieldwork is not always exercised with reasonable care. The user is convinced that his instrument is error-free and that no special treatment such as protection against direct sunlight is necessary. In contrast to this behavior are investigations which indicate clearly that digital levels show significantly bigger variations in the line of sight – due to changes in the temperature of the instrument – than optical levels (STAIGER, 1998). If a survey umbrella is not in use, additional effects occur due to one-sided heating caused by sunlight. If we are searching for ageless principles for geodetic measurements, it is hard to find recommendations in the educational books or in the technical literature. “The ABC of x, y, z”, presented by Peter Byrne and Gail Kelly at the FIG Working Week in Hong Kong, is one of the rare papers dedicated to this subject (BYRNE and KELLY, 2007). First, consider the whole. “Working from the whole to the part” is a well recognised surveying principle – working within the control system, interpolation contains errors, extrapolation amplifies them. Modern surveying technologies are such that the “whole” (the control system) may be found to be deficient. The “parts” (actual measurements) are of higher quality than the whole. This may require the surveyor to consider changing the whole to fit the principle of the parts. Know the tools. This principle is more important than ever before. It is not sufficient to read the data sheet and to listen to the vendor’s promises. As our measurement systems become more opaque (black box systems) the necessity of regular and meaningful checks increases. For complex systems like GNSS-receivers we can only proof the entire measurement system by comparing the final results with nominal values. Consider and analyze contributing errors. In most applications there will be an expected accuracy of objects in space. Uncertainties come from a number of sources, and they need to be assessed and analyzed with respect to the unknown values. This analysis is part of the design process before the real measurements and part of the validation process after the measurements. Record the defining parameters. 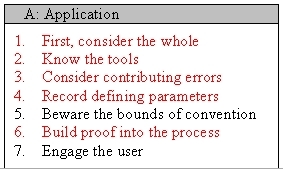 Record the adoption and the transformation into the existing coordinate system. This makes the whole survey traceable. Build proof into the process. A non-surveyor expects reliability and accuracy from our profession. Today we have efficient and accurate measuring systems, but this does not imply that our measurements and the final results are error-free. We have to proof our work with regular external checks. Repetitions control only the measurement as such, not the whole process! The best control for the entire work and the final results is checks which are independent from the production methods. Our modern and efficient equipment, which is at the same time easy to use, seduces us towards the misapprehension: “External checks of our work and our results are no longer necessary”. The above analysis reveals the opposite. External overall checks of our work are of particular importance today. the check and the validation of the entire system and the final results. Three hundred years ago there must already have been discussions about the necessary qualifications of a surveyor: why else did the Swiss mathematician Jacob Bernoulli say in 1684: “Surveying can only be practiced correctly by somebody who has experiences in mathematics. Therefore the state should not delegate this task – in contradiction to a curious prejudice – to uneducated and ordinary people”? Capabilities for carrying out precision mechanical work. This was necessary for the setting-up and adjustment of the instrument on every station. Physical robustness against unfriendly weather conditions. The requirement profile for field personnel became – with the stepwise modernization of our instruments (cf. Fig. 1) – smaller and smaller. If we measure with automated target recognition devices today, only the need for physical robustness remains. And this requirement is also weakened because observation times are shorter now than they were in the past. The observer’s influence on the observed angles is described in Table 4 according to the capabilities of his instrument. Today a surveying project will only satisfy our clients when the planning and design phase is done with a lot of care together with the customer (and other relevant partners) and the desired final results in mind. One big difference from the past is the need for real decisions before the measuring even starts (Fig. 7). Once the planning is completed, the field work starts with the check of the entire measurement equipment. The FIG Working Group 5.1 developed and published – under the chairmanship of the late Jean-Marie Becker (Sweden) – procedures in four phases for routine checks of electro-optical distance meters (FIG, 1994). These guidelines are still valid and the rules can easily be extended to other instruments (total stations, GNSS-receivers). 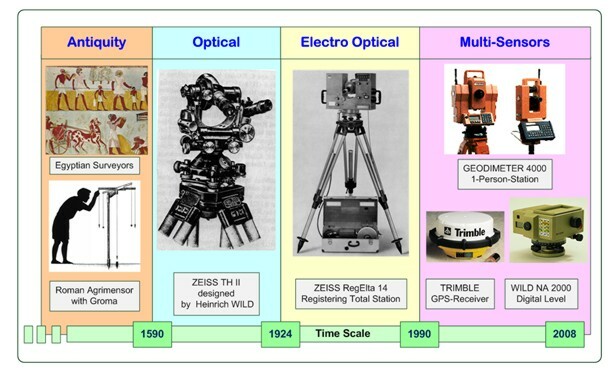 The ISO Standard 17123 (ISO, 2009) prepared by the Technical Committee ISO/TC 172, SC 6, now describes in eight sub-standards the field procedures for different types of geodetic instruments, namely theodolites (part 3), electro-optical distance meters (part 4), electronic tacheometers (part 5), optical plumbing instruments (part 7), and GNSS field measurement systems in real-time kinematics (RTK, part 8). If the equipment is working correctly and the quality of the results is within the expected range, the measuring itself can start. In general all the data are recorded on digital media. The important rule “build proof into the process” is already respected during the fieldwork with first checks for mistakes. Another important part of the data analysis is the determination of the achieved accuracy. Once all the errors have been detected and eliminated and the accuracy of the entire data is determined, the real data processing can start. Fig. 7: The planning and design phase of an actual surveying project. In the past surveying was quite clear. We had only a few measurement methods and for each task there was a specific instrument. In contrast to the current situation there was no choice between different types of instruments for the same task. The execution of all measurements was in general guided and controlled by regulations and there was no space for individual decisions regarding the measurement procedure. Following the established rules directly ensured good control of the acquired data. We determined only points – in the horizontal positions or heights – and the final results were either a map of predetermined fixed scale or a numerical analysis (Fig. 8a). Fig. 8a: The surveying tasks in the past and today. Today the possibilities and the actual demands are wider and differ more. 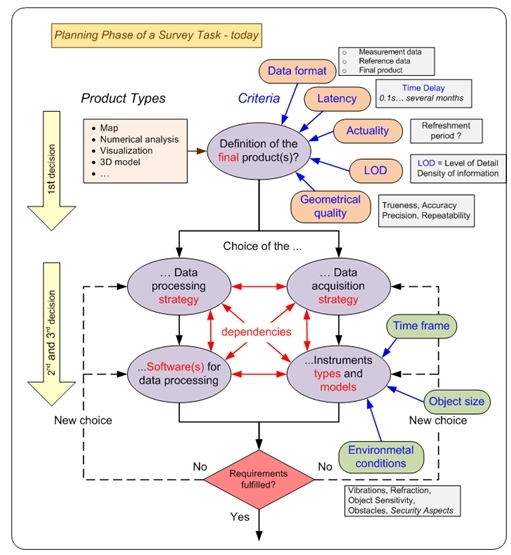 A surveying project can be divided roughly into three phases: planning & design, data acquisition, and data treatment (Fig. 8b). In former times they were executed one after the other. Today the planning phase is – relative to the execution phase – much more extended than it was before and the first part of the data treatment runs in parallel with the data acquisition phase. Due to the far more efficient equipment used for data acquisition and treatment, a project can be finished much earlier than in past decades. At the same time the results can be used for different purposes like planning, mapping at different scales and with different levels of detail, volume determination, and so on. Fig. 8b: The different phases of a surveying project (not to scale). The art of measurement does still exist, but it has changed significantly. In the past it meant “mastering the instrument”; today it should be transcribed as “mastering the entire process”. The handling of the instrument itself has become much easier, but the demands on the surveying engineer today are much wider and more complex. Mastering the process starts with decisions on the optimal measurement and data processing strategy, followed by the optimal choice of instruments (types and models). Today we often combine different measurement systems. about the different possibilities for data processing (side conditions, limitations, etc.). Once the decision on a specific strategy and concrete types of instruments is made, the realization can start. “Push the button” is indeed the easiest part of the field work, but there still remain some delicate manual operations like centering, leveling, and determining the heights of the instruments or targets. The art of measurement was limited in the past to the precise acquisition of data (observations!). Today the data acquisition itself has become much easier, but this does not mean that the whole measurement process is easy to handle and free of errors! The measurement process today is much more complex than it was decades ago. Therefore we need surveying experts who are able to master the entire process of data acquisition and data processing. Each measurement task is different and has its own characteristics. We have to take special care with an independent check and proof of the entire measurement system and the final results. This exactly is the modern art of measurement. 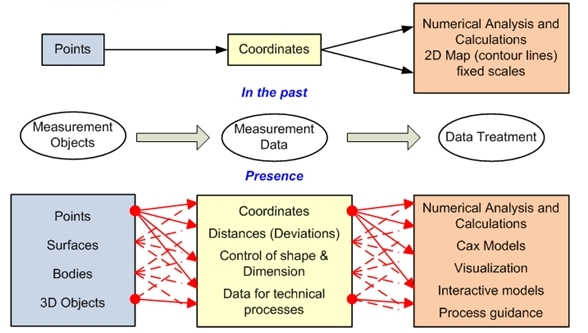 BYRNE, P.M. & KELLY, G. (2007) “The ABC of x, y, z – 21 Principles for Consideration by Surveyors and Other Geospatial Professionals”, FIG Working Week, Hong Kong. DEPENTHAL, C. (2004) “Stativbewegungen bei der Verwendung von Robottachymetern”. Allgemeine Vermessungs-Nachrichten (AVN), pp. 227–233. HELMHOLTZ, H. v. (1887) “Messen und Zählen erkenntnistheoretisch betrachtet”. INGENSAND, H. (2001) “Systematische Einflüsse auf praktische Messungen mit dem Tachymeter und Digitalnivellier”. 54. DVW-Seminar “Qualitätsmanagement in der geodätischen Messtechnik”. DVW-Schriftenreihe, Band 42, pp. 120–137. STAIGER, R. (1998) “Zur Überprüfung moderner Vermessungsinstrumente”. Allgemeine Vermessungs-Nachrichten 105 (11/12), 365 – 372. ISO Standard 17123 (2009) http://www.iso.org/iso/iso_catalogue/catalogue_tc/catalogue_tc_browse.htm?commid=53732.